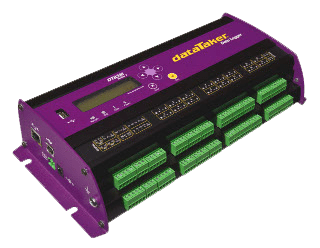 The dataTaker DT85 is a smart data logger that provides an extensive array of features that allow it to be used across a wide variety of applications. The DT85 is a robust, stand alone, low power data logger featuring USB memory stick support, 18 bit resolution, extensive communications capabilities and built-in display. The dataTaker DT85’s Dual Channel concept allows up to 32 isolated or 48 common referenced analog inputs to be used in many combinations. Store up to 5 million data points in user defined memory, log as much or as little as you need with independent control of schedule size and mode. Overwrite or stop logging once allocated memory is full. Archive data on alarm event, copy to USB memory or transfer via FTP, the choice is yours.